Topiary Guest House is an upmarket guesthouse, tastefully furnished reflecting style and grace. We are conveniently situated halfway between OR Tambo International Airport (Johannesburg) and the Kruger National Park, opposite the Middleburg country club, and only an hour's drive from Pretoria. Dedicated to warm and professional service, Caren your hostess provides her guests with combined friendliness, tranquillity and luxury. Topiary is centrally located in Middelburg, opposite the Middelburg Country Club and close to several restaurants and shopping malls. We offer five luxury en-suite rooms set in a beautiful lush lavender garden, each with DStv, Wifi, tea and coffee making facilities as well as self-catering units. Middelburg is located in the Mpumalanga Province which is famous for its fauna and flora. Witbank (Emalahleni - the new name for Witbank) is 25 kilometres from Middelburg and this area is one of the growth points in the Mpumalanga Province. Set in beautiful lush gardens and lavender, Topiary Guesthouse invites guests to spend a night or longer in luxury accommodation. Take a break and explore the beauty of Mpumalanga. 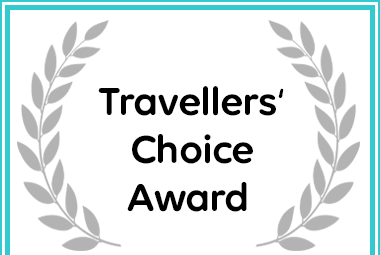 Afristay awarded Topiary Guesthouse in Middelburg (Mpumalanga) a Travellers' Choice Award. © Topiary Guesthouse 2004-2019 All right reserved.